It’s always fun to celebrate Christmas morning with a special fun breakfast! Every year I like to whip up something cute and special for my family – all the better if it’s something healthy, too! 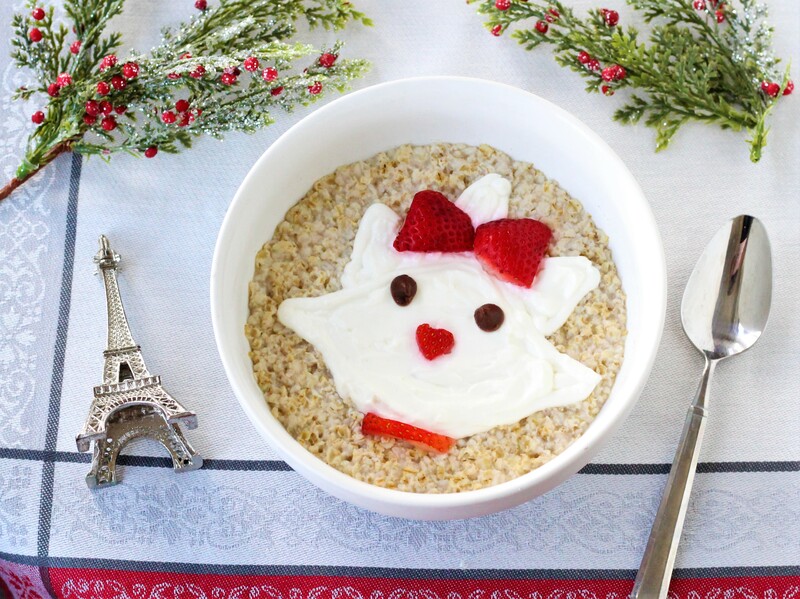 This Aristocats inspired holiday oatmeal is the perfect combination of healthy, tasty, and festive! Last year in December, I took my dream trip to Paris and Disneyland Paris, and as a meet and greet character they had a holiday version of Marie, with a red holiday bow and collar. We were in France of course, so there was lots of Marie to go around, since she’s a native to Paris. So for me, this breakfast was also a pleasant trip down memory lane! Happy holidays, and enjoy your Aristocats recipe inspired by Marie! Optional: Dark chocolate chips, any additional toppings you may like. Cook your oatmeal according to the package instructions/serving amount you would like. Place yogurt in a piping bag or condiment bottle, with a medium round tip. One your oatmeal has cooled a little, “draw” on your yogurt in the shape of Marie’s head using your piping bag or condiment bottle. Now “draw” on her ears and the top tuft of her hair. Cut a small strawberry in half, and place them on top of her head to use as her holiday bow. Cut a small strip of strawberry for Marie’s collar, and a small triangular piece of strawberry for her nose. If you like, add on two chocolate chips for her eyes. If you would like more texture, you can also sprinkle on shredded coconut, or some honey around the edges to add more sweetness to your oatmeal.